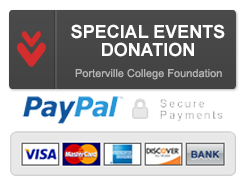 The following information will offer ideas as to how you can be a part, truly a partner, in the shaping and developing of our future through your gifts and support of the college students of Tulare County, California. Your rewards will be more than the tax savings. There are the personal, emotional, and spiritual rewards of helping others. Helping others creates cherished and tender moments that can't be duplicated in any other way. There are as many different ways to support Porterville College as there are needs for your support. The following stories share some of the different ways people can become partners with us in changing lives. Take a moment to see how people - perhaps in circumstances similar to yours - have found the means to offer support and in turn enriched their hearts in ways they never imagined. Your personal circumstances will determine the best structure for you and we will be glad to answer questions and offer suggestions confidentially. Please call or email us by viewing our Contact information on the left-side of this page. Donors will have several options in choosing a method of giving most appropriate to their circumstances and intentions. Gifts to the Porterville College Foundation qualify as charitable deductions for income tax purposes and the foundation recognizes donors through several levels of gift-giving membership circles. Your own attorney or specialists are available to discuss questions related to contributions. These gifts are the most popular type of charitable contribution because of their simplicity, immediacy, and ease of delivery. Each arrangement offers distinctive and independent features tailored to the needs and goals of each individual donor. These gift options may become effective through outright transfers during the donor's lifetime or through transfers under the owner's will. Life Estate gift of real estate (donor may deed the property, or an undivided partial interest in the property, to the Foundation and retain the right to live in that property for the rest of his or her life). Bequest via will (donor can designate a portion of his/her assets to the Foundation through the estate).